December 1st is gray and wet. I'm giving my first try at an amaryllis bulb. The brown bulb is going into the coir fiber (Not intended for human consumption it says) that I am reconstituting in warm water. 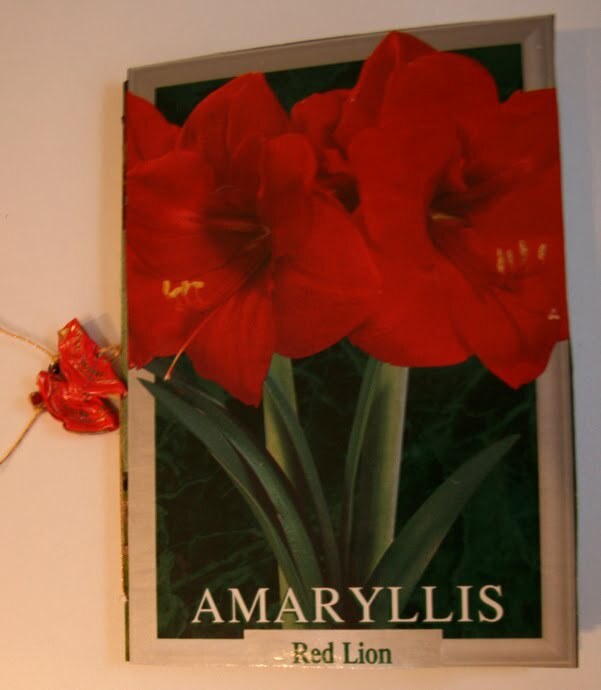 The box is too beautiful to put in recycling so I've made a book to record the growth (I hope) of my amaryllis. The additional facts and tips on the box say that they prefer 70 degree temperatures. That might be difficult here. I used used copy paper with writing on one side. I cut it to fit the size of the cover when folded, then glued two pieces together with the writing facing to form blank sheets of paper. I folded the papers in half to make the pages of the book. 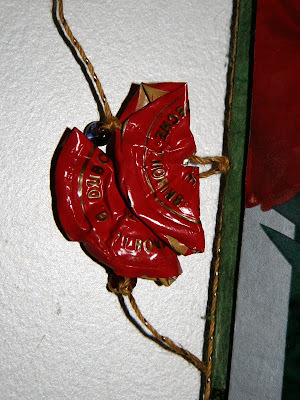 The spine (folded edge of the outer paper) was covered with papers from the collage box and the amaryllis box covers were glued to either side. I did a simple 3 hole binding with gold crochet cotton and added a bead and a decoration made from the top of a Beaujolais Nouveau bottle from Thanksgiving to each end. Ahhh, I must go dig the box out of the trash. I planted one today too! What a great idea. Great repurpose of a package. Wonderful to also find a use for the paper with one good size. Oh Susan! That is delightful. You've rescued a beautiful box and made a book to record the Journey of the Amaryllis into the light! Lovely, lovely, lovely! I am inspired. So I rescued the Red River Cereal box and will assign it another life as a record of my new "diet". Thanks for sharing all your great ideas. EXACTLY what I would do under the circumstances. I have been trying to drive myself toward using recycled office paper; maybe the idea of gluing thepages face to face will enable me to make the leap. Can you say more? 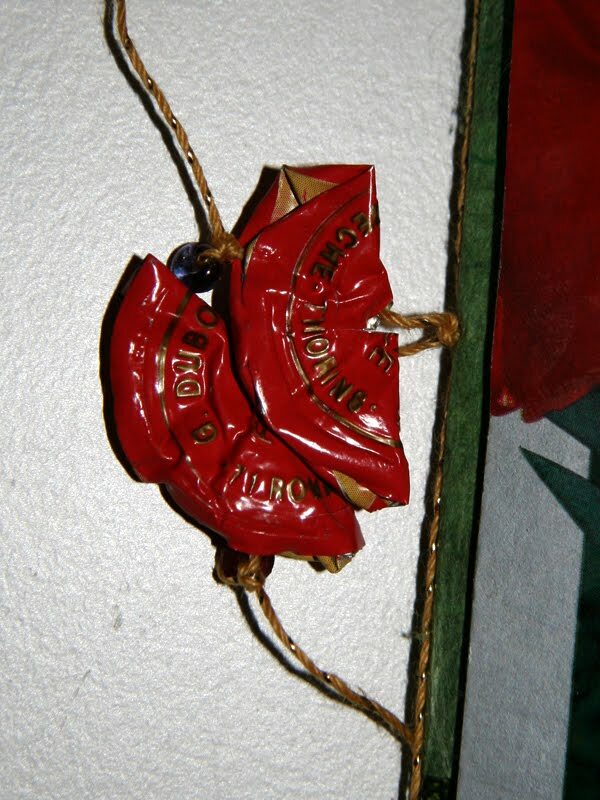 Edges only or the full sheet(s) -- and with what sort of glue applied how? My twenty years of working with kids has over time eroded all semblance of careful bookmaking. I just put a line of glue stick around the edges of one piece of paper, place the second piece on top, and smooth it out. 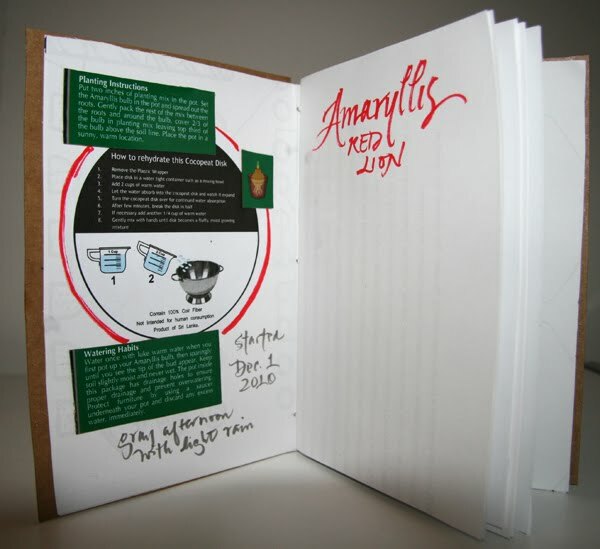 I have a journal I made that way a few years ago still intact.